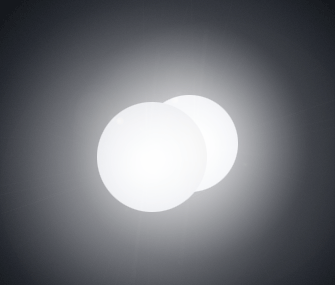 Artist's impression of eclipsing pair of white dwarfs as seen from viewpoint of Earth. The Liverpool Telescope (LT) has been used to discover what is only the second eclipsing white dwarf binary system ever known. Over 50 close white dwarf doubles are catalogued, but previously only one other (discovered last year) was known to be eclipsing. Astronomers S.G. Parsons, T.R. Marsh and B.T. Gänsicke from Warwick University UK, A.J. Drake from California Institute of Technology USA and D. Koester from Kiel University Germany used the LT's RISE frame-transfer CCD camera to perform a long monitoring campaign (between February to April this year) to obtain well-sampled lightcurve measurements of the binary star system CSS 41177, which lies 1140 light years from the Solar System. The LT-RISE campaign data were combined with spectroscopic observations made on 15th March using the GMOS instrument on Gemini North. This star system was previously listed as a white dwarf and main-sequence pair, with just one eclipse occurring as the secondary body passed in front of the primary as seen from Earth. But the more detailed lightcurve measurements revealed the fainter eclipse of the secondary. This discovery, along with the Gemini North spectroscopic measurements, allow the system's orbital and physical characteristics to be defined as consisting of a pair of white dwarfs each with about 28% the mass and 2% the diameter of our Sun (just over twice the diameter of the Earth). They orbit around their mutual centre of gravity every 2.8 hours, the diameter of the orbit being only 50% larger than that of the Moon's orbit around the Earth. Size of CSS 41177 orbit compared to Moon's orbit about the Earth. Diameters of stars and Earth drawn to scale. The binary was formed by the more massive star losing its envelope (and extra mass) to its companion before having time to fuse its helium into heavier elements and ending up as a helium white dwarf. The smaller companion later did the same, the envelope this time dispersing as it could not be used by the primary in its white dwarf mode. In just over a billion years, thanks to gravitational radiation the orbit will have spiralled down to the point where the two stars merge, finally igniting the combined helium as a hot subdwarf, then settling down as a single white dwarf. This system is of particular interest; for the first time it will allow precise measurements of white dwarf mass and radius. Unlike the first eclipsing white dwarf binary found, the spectra of both bodies in this system can be detected. Both objects are also of a relatively rare type, being composed mainly of helium. The full paper has been accepted for publication in the Astrophysical Journal and is entitled "A deeply eclipsing detached double helium white dwarf binary". The official press release can be found at the Warwick University site.